The beginner's hydraulic scale PCE-FLW 1 is designed to measure the load at forklifts, but fits also many other applications. The beginner's hydraulic scale supports a hydraulic pressure of up to 250 bar and thus it is ideal for all kinds of tasks and applications. 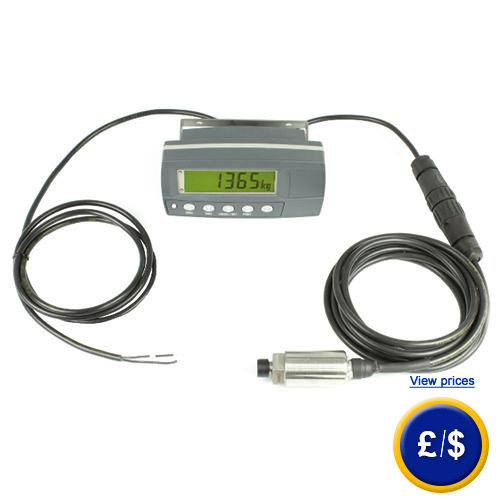 The pressure sensor of the beginner's hydraulic scale PCE-FLW 1 measures the pressure inside hydraulic circuits. The measured pressure is then used by the device to calculate the weight, which is then indicated on the display. In order to gain reliable values, the system has to be calibrated after installation with standard weights. For the application on loading shovels the load's position and the hub height is of great importance for the accuracy of the determined values. A weighing based merely on the hydraulic pressure can not be realized for the hydraulic of a tail at a tractor due to the varying leverage effects and rotating movements of the lever arm. If there are any questions about this beginner's hydraulic scale please have a look at the technical specification below or call: UK customers +44(0) 23 809 870 30 / US customers +1-410-387-7703. Our technicians and engineers will gladly advise you regarding all hydraulic scales and all products in the field of measuring instruments, regulation and control and scales. 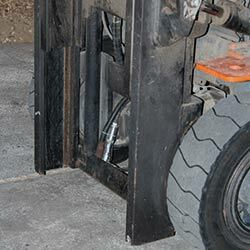 Here you can see the beginner's hydraulic scale PCE-FLW 1 mounted to a forklift. 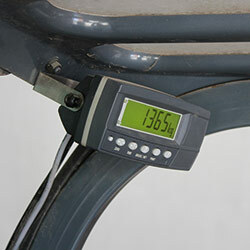 By means of the beginner's hydraulic scale the weight of the lifted load can be easily determined. This is especially functional for industrial factories. Here you can see the Display of the beginner's hydraulic scale PCE-FLW 1 mounted inside the cockpit of a forklift. By means of the installation equipment a read-out of the measured values can be easily performed at any time. So that even during operating the forklift the load weight can be always checked on.